Edited by greenTicecream, 30 January 2006 - 08:47 PM. when i first saw that picture i had NO idea what it was or what its supposed to look like lol...but then when i read it is a squiral i started to see it. either way i know how to make a turtle...pretty hard...i am not too dedicated though. i know stores that make hello kitty and a lot of cool stuff like penguines and stuff. i might check it out and make one myself give it to my mom. i wonder if there's a website that i can order online to buy a book that shows how to make these beads things. i think they are really pretty. i want to learn. your squirrel is really nice...so cute! OMG! you know how to make a squirrel? That's hard. You so good. I thought the heart was suppose to be easier but which heart did you wanted to learn? um..i just wanted a random 3-d heart......i know how to make 2 d ones..but they don't look as pretty. anyone know of any good web sites that show you how to do this? My girlfriend has several books about that. I'll ask her to scan some more later. i know how to make the 3 d heart, i have instructions, but no scanner! I have gotten some instructions too, but they are so simple and not detailed enough...so hard to follow. Worst of all, it's in chinses, so can't read...only depending on the pictures...which doesn't really help at all. 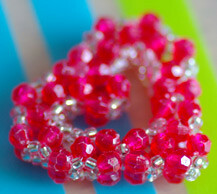 i hope someone will post some instrction on how to make these 3d bead stuff with english instrcutions...lol.. SAME HERE!! I'm dying to know how to make these cute things!! i knew it was a squirrel before i read it it is just tooo cute!! did u make up the pattern or did u follow one? if so, where is the pattern? thanks!! wow that is really good! i really wanna learn how to make that. i've seen books on them.. but they were in chinese.. and i cant read it!! so if someone would show us that would be awesome! Oh those..theres classes u can take. But u have to buy the beads first and string in the inside. Yea..i used to go to a class and that's where I made the squirrel...I can't post the instructions, because I'm not sure where they are..and they are VERY HARD to follow.. I tried to make the squirrel again outside of the class..and I couldn't do it. Wow! I admire you for your patience and skill into making that squirrel! I am making 3D beaded roses now and it is driving me nuts cos all the beads are so small. anyone found any instructions yet?? or anyone posted any images yet?? But I have no idea how to make it!!! It looks reli cool... I think my mom's friend knows how to! It's like her hobby! It looks reli cool! i know a website that you can buy the book from and you can look around for english. does anyone have some instructions? OMG! I've been attempting to finish making a squirrel the last few days too! Then I came across this site and saw yours =). What's keeping me, is that the tail keeps failing to stay upright. I've tried adding more string it to make it tighter but it still keeps tipping over. Do you have any secrets to help me out? ooOoOoo................can anyone post instructions for the squirrel or any type of 3D bead work???? please!!! Technically it's 3D as there are two rows... Or do you mean a more rounded one? Edited by avin85, 30 January 2008 - 04:33 PM. hmmm maybe i have misstaken but i was thinking about the very thin transparent plastic like paper, not really those that you use to wrap books with... i think it is used in cooking.... i am not sure. I think it was written in chinese on the hello kitty tutorial. #34 Bella and Edward 4eva! at first i didn't see it but now i do. Edited by Kiwi4Ever, 01 May 2009 - 02:31 AM. wa....the beads squirrel is so cute!